On the morning of April 10, China’s first ship capable of navigating seas and rivers “Jianghai Zhida I”, with full load of 20,000 tons iron ore, completed its first voyage in Ma An Shan, Anhui Province. The ship unloaders transported all the iron ore to Magang storage yard by belt conveyor on shore, which marked the beginning of a new era for river-and- sea coordinated transport of China’s shipping industry. 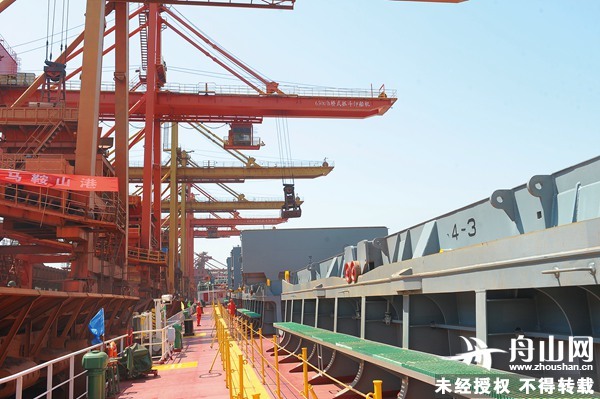 Carrying iron ore loaded on Shulang Lake ore transfer terminal of Ningbo-Zhoushan Port, the “Jianghai Zhida I” set sail at 14:00 pm on April 5 from East China Sea to Yangtza River, sailing upstream toward Ma An Shan harbor raw material terminal. Different from previous sea ships which could not reach sail safety requirements of Yangtze River concerning ship performance and control, the “Jianghai Zhida I”, as the first 20,000-ton ship capable of navigating seas and rivers in China, will completely change the situation that river ships are unable to enter seas while large-capacity sea ships are unable to navigate to ports west to Nanjing along the Yangtze River . Zhejiang Xinyihai Shipping Co. , Ltd., the shipowner of the ship, appointed Chen Yi, a captain with more than 30 years experience in sailing in seas and rivers, to carry out the maiden voyage task. “This ship is the best 20,000 tons level cargo ship in control performance I have ever manipulated”, Chen Yi said. During its maiden voyage, the ship could easily cope with various conditions on crowded shipping lanes of the Yangtze River, which is much safer than ordinary sea ships capable of navigating in rivers, and stronger than river ships in terms of stability against winds and waves. Moreover, it did not need to load off during voyage , greatly increasing the efficiency with minimized resource depletion as well as environment pollution. As a convient, efficient, eco-friendly economic mode of transportation, the ship capable of navigating seas and rivers will serve as an important vessel for river-and-sea transport, a solution for solving the bottleneck problem in river-and- sea coordinated transport system, as well as an innovative conveyance to improve the transport efficiency in the Yangte River.